David Bornstein is what many would consider a rare bird — an optimistic and forward-looking journalist. 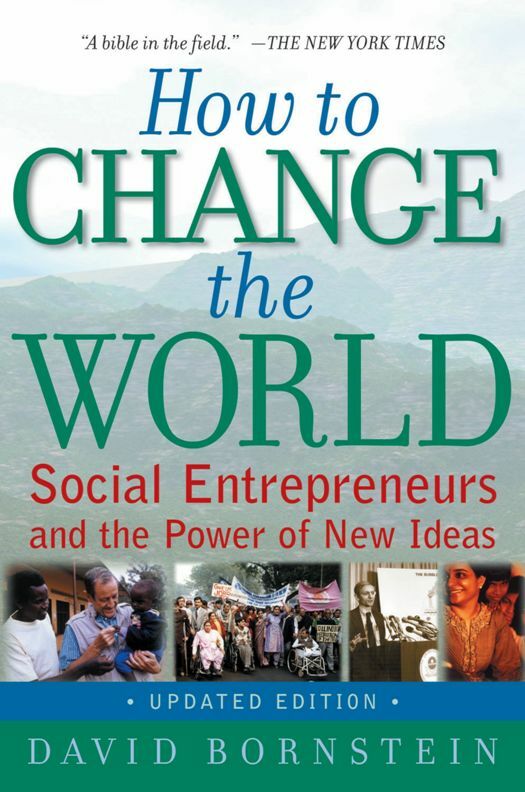 Bornstein is also one of my favorite writers on aid and development issues, for the New York Times Opinionator column and as an author of a number of important books including one on the anti-poverty scheme known as microfinance, The Price of a Dream, and his more recent book How to Change the World, a look at the social enterprise movement. On Thursday, it was announced that Bornstein and his NYTimes colleague Tina Rosenberg were among the winners of 90 new grants, each of which starts out at $100,000, from the Bill & Melinda Gates Foundation’s Grand Challenges Explorations program. That wasn’t quite right: Bornstein later responded, after the awards were announced, that he and Rosenberg will not receive any of the grant money and are only collaborating on the Gates-funded project at Marquette University. I missed the nuance there. Sorry about that. Bornstein, who contacted me after this post was published, said the NY Times prohibits them from accepting grant money (for work done at NYTimes) and they are unpaid collaborators with Marquette, allowing them to repurpose their columns and to help them think through the process. The Grand Challenges Exploration program was created by the Gates Foundation mostly to fund ‘wacky’ (aka high risk) scientific projects and that’s mostly still what it has supported among its 800 projects funded to date. One example pictured at right: Agenor Mafra-Neto and his colleagues are building inexpensive laser bug sensors that accurately count and identify flying insect pests from a distance. Because it’s always good to know exactly how many and which types of bugs there are. Anyway, you can read more about the latest round of wacky scientific winners at the philanthropy’s website. Bornstein was in Seattle a few weeks ago for a conference on Changemakers. I had breakfast with him to talk about his work aimed at promoting a very specific kind of ‘solutions-oriented’ change in media practices, in journalism, aimed at shifting the media away from sensationalism and negativity — and more toward contributing to the efforts aimed at making the world a better place. I hadn’t been able to reach David earlier this week (he lives in NYC, so that’s not surprising) to ask about the Gates grant but we talked about many of the same questions at breakfast. The title of the Gates grant program “Aid is Working” will likely raise a red flag for many journalists. It sounds a bit promotional. Many of us have the same concerns with ‘solutions’ journalism. Q I’m all for increasing the capacity of journalists, of the media, to use our talents to make the world a better place. But isn’t it going too far to say journalists should have to suggest possible solutions to the problems they identify? Q Well, most of would rather be Harry Potter or a CSI sleuth if we could, but on what basis would we assume that a journalist would even be qualified to point toward a solution to any problem? Q But how do you avoid slipping into advocacy for a particular solution? Q Still sounds you’re asking the journalist to risk looking like an advocate. The Gates Foundation, for example, funds a lot of media and also says it wants to see more success stories. Doesn’t that kind of thing worry you? Q Okay, I get that and I agree that our goal as journalists should be to have a positive impact. But I still think it’s unclear where you draw the line between remaining an independent observer and emphasizing solutions. Another thing that’s unclear to me, which we don’t have time or space to explore, is what people mean by ‘social enterprise.’ It’s big in Seattle. Is it clear to you what’s meant by social enterprise? was it “negative” reporting when the Tuskegee Syphilis study was exposed? or when Rachel Carson wrote about the effects of DDT? “Negative” reporting is exactly what catalyzes positive social changes. This “solutions journalism” sounds to me like propagandizing for Gates Foundation projects. I’m a big fan of your work, I should say at the outset (readers, go to soniashah.com). To be fair to David, it’s not easy for me to describe what he’s trying to do here and perhaps I was too simplistic in this post. He’s well aware of the risk of veering off into advocacy or propaganda and doesn’t shrug it off. But he also thinks we need to evolve beyond being simple watchdogs sniping from the sidelines. I should emphasize that he’s been working on trying to find a way to shift journalists toward incorporating ‘solutions’ into their reporting long before he got this Gates grant — which goes to a number of people and will fund a collection of case studies aimed, in part, at finding the right balance between doing independent analysis or critiques and contributing to problem solving. He’s not suggesting we be ‘positive’ or only emphasize the good. He just doesn’t want us to be satisfied with simply identifying a problem. I suspect he would see your writing on malaria as a good example of solutions journalism. This is no different than medical ghostwriting, except that instead of obscuring a publication’s author because a sponsoring organization has a clear conflict of interest, this programs obscures the money and the fact that it’s part of the PR program of a foundation by design, and often the PR strategies of the companies Gates Foundation staff are often drawn from. Some journalists are willing to make as many excuses as they can for this sort of behavior because the pond is shrinking and jobs are hard to find. Even though there’s a *reason* that the NY Times doesn’t allow its reporters to accept grants for their reporting work, that apparently hasn’t stopped these two from skirting around the spirit of that policy to serve as a large foundation’s communications staff. And whether or not it’s a conflict of interest or appropriate for a journalist doesn’t hinge solely on whether it’s done pro bono. I agree with Gates Keeper. Also, isn’t “sniping from the sidelines” a very pejorative way to describe journalism? Identifying problems is a critical part of helping foster positive social change. I’d gander it’s the most important part. I certainly would rather that scientists come up with the innovative vaccines and policymakers with the innovative policies, not journalists! And exactly where are all these innovative solutions that are going unreported? I just don’t see it. I do see that the Gates Foundation’s work is coming under increasing scrutiny and I’d guess they probably don’t like that. So the greatest risk is irrelevance? How’d it get to that? Then that calls for taking the money! Sorry, I mean standing next to the guy taking the money. The Gates Foundation is clear about its intentions. They “invest” money in advocacy — of which journalists are direct or indirect recipients — in order to MOVE PUBLIC OPINION and achieve policy objectives. They don’t like answering questions nor do they practice transparency. They are about winning. Doing so involves softening opposition, amplifying praise, and controlling the agenda. One form of this influence machinery is laundering money through universities that are only too happy to take the money for its prestige and hope a little more might come their way and fund faculty and perhaps a new building. To test this theory, consider who calls the shots when the university does a press release on a grant. There is no academic freedom or independence. Once the money goes to the university or another 3rd party conduit, staff are hired to do the work and nobody forgets where the money is coming from. It’s truly sad to see journalists, apparently fearful for their professional futures, take the money and twist reasoning to justify the practice. Since Gates continues to polish its image and expand this program, perhaps they should endow a truly independent entity to do investigative reporting of one of the world’s most powerful and secretive influence peddlers: the Gates Foundation. Who knows? We might get some interesting stories they public will appreciate. And “irrelevance” will be put off for another year. Jake, Reading through your and others’ comments here, I see there is a misunderstanding about the Gates grant to Marquette University and the practice of solutions journalism. 1. The Gates grant is going to Marquette so they can develop a digital tool to take NY Times Fixes columns and other solutions-oriented journalism and aggregate and organize it so it can serve as mini-case studies for universities. The money will be used to develop software and to encourage collaboration among educators to see how this kind of journalism can meet their teaching needs. The reason why Fixes columns are good for this is that they focus on problem-solving and they highlight real world examples where there is evidence of effectiveness. 2. Solutions journalism is a practice through which reporters do rigorous reporting about responses to problems, and explain if and how they work, based on evidence of effectiveness. We think of it as the ‘other half of the story’: Once a journalist reveals that a problem exists, it usually turns out that people are responding to that same problem, sometimes quite intelligently, sometimes not. That activity is also newsworthy, but it is covered far less regularly. The fact that journalists think that they should somehow cease their reporting after a problem is revealed (without covering the responses, however sensible) is an institutional bias that is now quite clearly out of whack with what we know about how people respond to information (i.e., too much negative information causes people to tune out, deny the message, seek distraction, etc. to manage the anxiety). It is hard to justify reporting mainly on problems while overlooking potentially creative responses to those problems — but that’s exactly what journalists do today, and we do it because we are afraid of being called advocates. But solutions-oriented reporting can be done well, while adhering to standards of independence and accuracy. And if we don’t do it, the result is that we present a false image of reality — an intentionally skewed worldview that tends to overwhelm people and keeps the public in the dark about emerging pathways for change. Thanks for your clarification. I’m still wondering, though: what are some salient examples of creative, newsworthy solutions that are going unreported? On what basis do we know that they’re not being reported on because journalists are afraid of being called “advocates”? If, as you suggest, solutions journalism is about rigorous, evidence-based reporting, that risk seems minimal. Also, how do we know that “solutions” journalism doesn’t breed the opposite of “tuning out,” i.e. complacency? It still seems to me that the much bigger problem is that a lot of serious problems go unreported (MSF points them out every year) than that solutions go unreported.